The Met Office has issued a yellow weather warning for high wind and gales across southern and eastern England today, Tuesday November 17 and tomorrow. A yellow warning for gusts reaching 60–70mph, and possibly 80mph along exposed sections of the coast, has been issued by the Met Office from 9am until tomorrow morning. The weekend’s heavy rainfall heralds the start of an unsettled week as a series of low pressure systems are expected to move across the country. The first will arrive late Monday before another brings stronger winds and rain on Tuesday and another system brings rain on Wednesday. Meanwhile the weather is expected to turn colder for many by the end of the week. The Met Office forecast for the east on Tuesday is for strong winds developing during the afternoon with severe gales during the evening. Andy Page, Chief Meteorologist at the Met Office, said: “Storm Barney is expected to be a fast moving storm system bringing a few hours of severe gales to southern parts of Britain later tomorrow afternoon and evening. It brings the potential for travel disruption and could bring down trees. The Country Land & Business Association, which represents thousands of landowners, farmers and rural business in the eastern region, is warning its members they could face a claim for damages if a tree or a large branch falls in a public place. 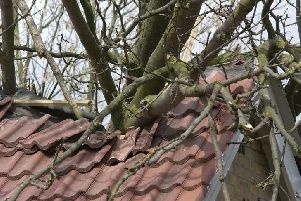 CLA East Regional Surveyor Tim Woodward said: “Liability for damage or injury caused by fallen trees and branches depends on whether the owner knew, or should have known, that the tree was likely to fall. “We are advising our members to inspect their roadside trees as soon as possible and keep a written record of the inspections to demonstrate due care and diligence in the unfortunate event of an accident. The outlook for Wednesday to Friday is generally windy with rain crossing many areas at times, but also some drier spells between. Gradually turning colder from the north on Friday.